We think that these letters may have been intended for letterpress, but ours were never used and came in a sealed package so they have not been inked (although some letters are a bit tarnished. 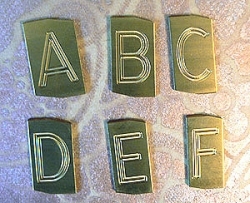 )The letters measure .75 inch wide and 1.25 inch high. The back is flat and these are solid brass so they would patina well.We have a limited quantity of each letter and number.Made in the USA.